Spring is here and with the warm weather you may have some construction projects plans. 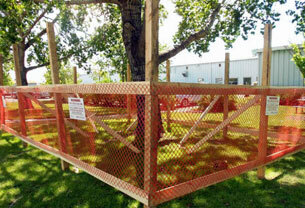 Here are some suggestions to keeping your trees safe during the construction process! Possible ways in which existing trees may be damaged during a construction project and methods for planning and facilitating the prevention of tree damage. Homes are often constructed near existing trees to take advantage of their aesthetic and environmental value. Unfortunately, the processes involved with construction can be deadly to nearby trees. Proper planning and care are needed to preserve trees on building sites. An arborist can help you decide which trees can be saved. The arborist can also work with the builder to protect the trees throughout each phase of construction. How Trees Are Damaged During Construction Physical Injury to Trunk and Crown. Construction equipment can injure the above-ground portion of a tree by breaking branches, tearing the bark, and wounding the trunk. These injuries are permanent and, if extensive, can be fatal. Digging, grading, and trenching associated with construction and underground utility installation can be quite damaging to roots. A tree’s root system can extend horizontally a distance 1 to 3 times greater than the height of a tree. It is important to cut as far away from a tree as possible to prevent damage that can compromise tree health and stability. Cutting under a tree’s crown can reduce tree vitality. Cutting roots close to the trunk can severely damage a tree and limit its ability to stay upright in storms. An ideal soil for root growth and development contains about 50 percent pore space for water and air movement. Heavy construction equipment can compact soil and dramatically reduce pore space. Compaction inhibits root growth, limits water penetration, and decreases oxygen needed for root survival. Smothering Roots by Adding Soil. The majority of fine water-and-mineral-absorbing roots are in the upper 6 to 12 inches (15 to 30 cm) of soil where oxygen and moisture levels tend to be best suited for growth. Even a few inches of soil piled over the root system to change the grade can smother fine roots and eventually lead to larger root death. Trees in a forest grow as a community, protecting each other from the elements. The trees grow tall with long, straight trunks and high canopies. Removing neighbouring trees during construction exposes the remaining trees to increased sunlight and wind which may lead to sunscald or breakage of limbs and stems. Not all trees on the building site can or should be preserved. Your arborist can assess the health and structural integrity of trees on your property and suggest measures to preserve and protect them. When determining which trees to retain, consider the species, size, age, location, and condition of each tree. 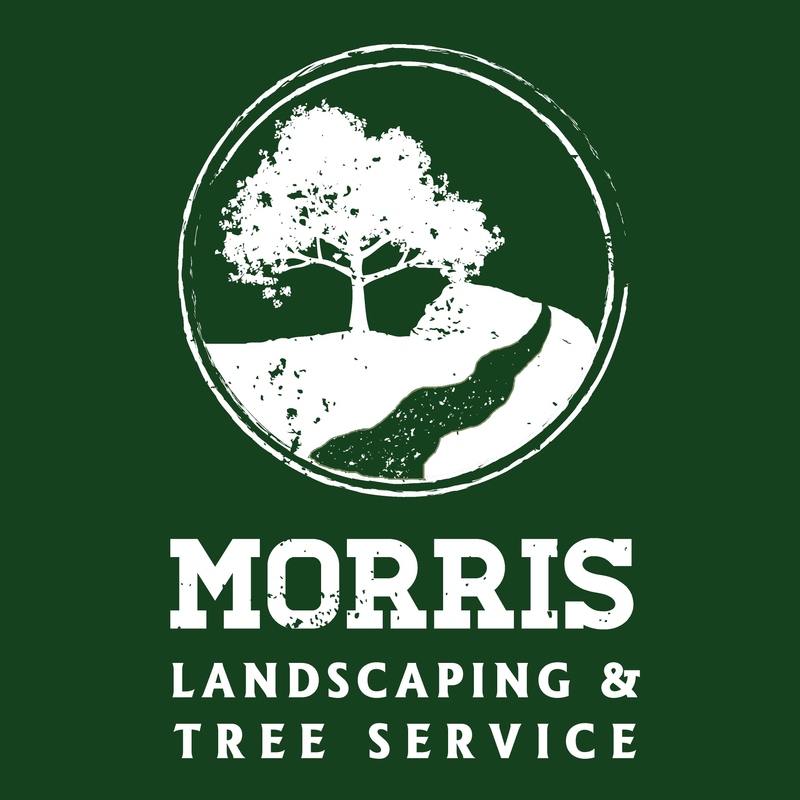 Your arborist can advise you about which trees are more sensitive to compaction, grade changes, and root damage. Your arborist and builder should work together early in the planning phase of construction. Sometimes small changes in the placement or design of your house or driveway can make a great difference in whether a critical tree will survive. Alternative construction methods can be discussed, such as bridging over the roots as a substitute for a conventional walkway, if flexibility in placement is limited. If utilities cannot be re-routed away from trees, less damaging tunnelling and trenching installation techniques exist. Treatment for construction damage is limited, so it is vital that trees be protected from injury. 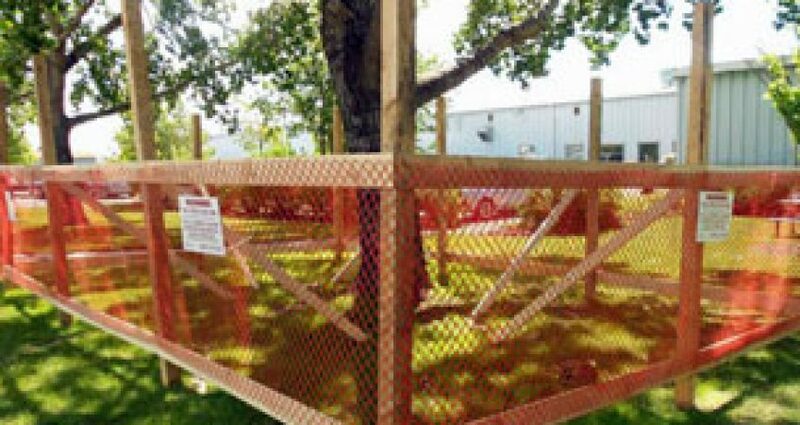 Set up sturdy fencing around each tree that is to remain, as far out from the tree trunk as possible to provide above- and below-ground protection. 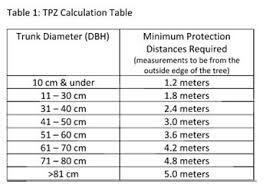 Place fence approximately one foot (0.3 m) from the trunk for each inch (2.5 cm) of trunk diameter. Instruct construction personnel to keep fencing intact and the fenced area clear of building materials, waste, and excess soil. No digging, trenching, or other soil disturbance should be allowed in the fenced area. If possible, allow only one access route on and off the property. All contractors must be instructed where they are permitted to drive and park their vehicles. Often this same access drive can later serve as the route for utility wires, water lines, or the driveway. Specify storage areas for equipment, soil, and construction materials. Limit areas for burning (if permitted), cement wash-out pits, and construction work zones. These areas should be located away from protected trees. All measures intended to protect your trees must be written into the construction specifications and should detail exactly what can and cannot be done to and around the trees. It is a good idea to post signs as a reminder. Fines and penalties for violations should be built into the specifications. The severity of the fines should be proportional to the potential damage to the trees, and should increase for multiple infractions.  Communicate your objectives clearly with your arborist, builder, and all subcontractors. Construction damage to trees is often irreversible. Visit the site at least once a day if possible. Your vigilance will pay off as workers learn to take your wishes seriously. Take photos at every stage of construction. If any infraction of the specifications does occur, it will be important to prove liability. 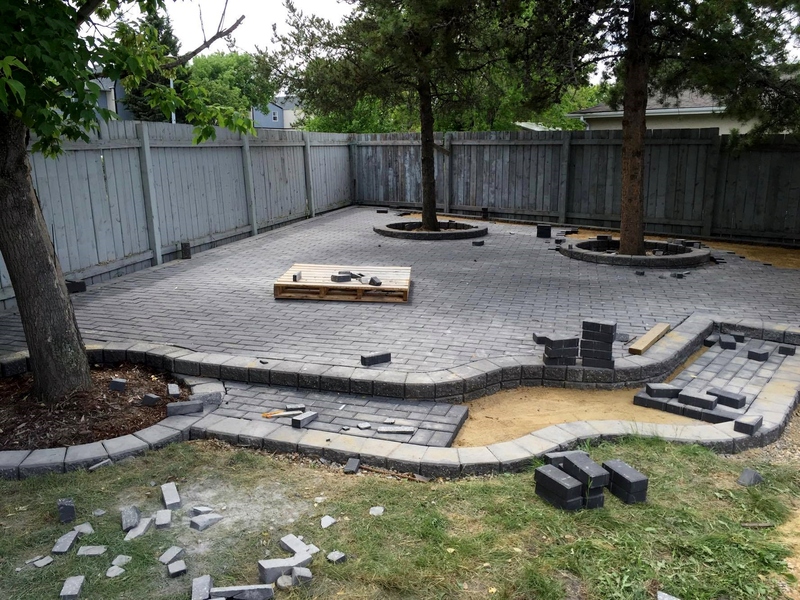 Careful planning and communicating with landscape designers and contractors is just as important as avoiding tree damage during construction. 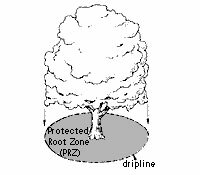 Irrigation system installation, grading, and planting bed cultivation can damage root systems. Your trees will require several years to adjust to the injury and environmental changes that occur during construction. Stressed trees are more prone to health problems, such as disease and insect infestations. Talk to your arborist about continued monitoring and maintenance for your trees. Despite the best intentions and most stringent tree preservation measures, injury to your trees may still occur. Your arborist can suggest remedial treatments to help reduce stress and improve the growing conditions around your trees.